Establish a lively, safe, and attractive pedestrian environment. Expand open spaces and create great public places. Include 20% new housing units as affordable. The South Central Waterfront encompasses 118 acres, comprised of 32 separate private properties, directly across the lake from downtown. Here is a map of the area. 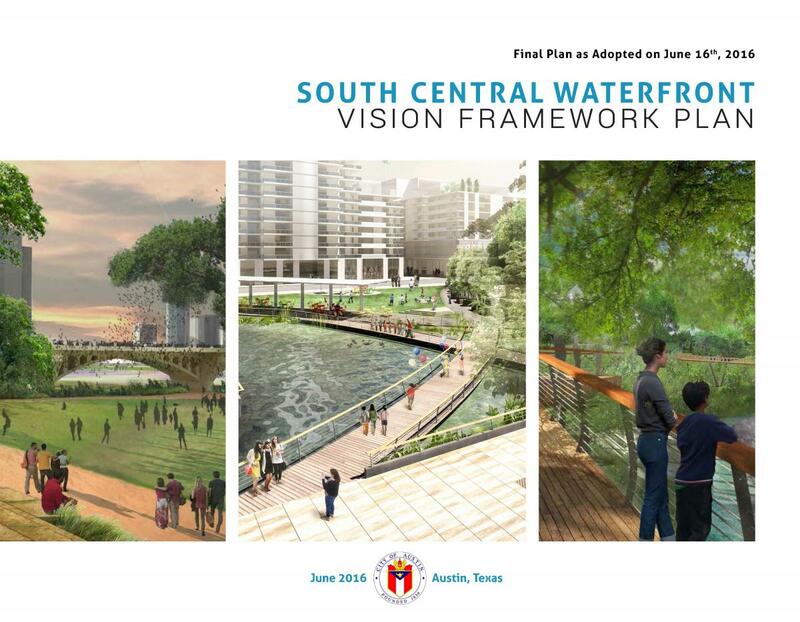 The City Council adopted the South Central Waterfront Vision Framework Plan (South Central Waterfront Plan) as an amendment to Imagine Austin in June 2016. The South Central Waterfront Plan sets a path to create a districtwide network of connected green streets, parks, trails and public open spaces (approximately 20 new acres), as well as achieving 20% new affordable housing units (approximately 530 units). The South Central Waterfront Plan recommends a series of implementation measures including development of regulations, adoption of innovative financial tools, fostering public-private partnerships, leveraging the single city property at One Texas Center for affordable housing, and capital improvement investments in infrastructure. A newly formed South Central Waterfront Advisory Board is working with staff and stakeholders to provide recommendations to the City Council on implementation. Click Implementing the Plan to learn more. Planning studies for the waterfront that date back 30 years have consistently called for harmonious development which respects the tremendous asset of the lake and shoreline. 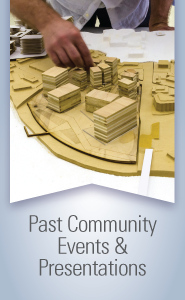 View the Past Waterfront Planning page for more information on the history and past planning efforts of the waterfront. Visit the Implementation page for how the Vision is becoming reality. Subscribe to receive e-mail updates and invitations to public meetings (top left side of this page). Watch & Learn about the initiative through the video gallery. Engage with the newly formed South Central Waterfront Advisory Board.